Despite the general opinion that it was an overall lackluster year for movies, the box office haul belies such a view, and not just because of "Avatar." 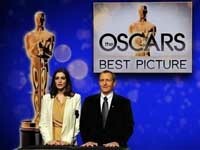 With a history-making blockbuster, several high-art, high-impact indie films and some bona fide crowd-pleasers in the mix for best picture, the Academy Awards are poised to put on a snappy, in some races suspenseful and audience-friendly and ratings-grabbing Oscar telecast. A lot of interesting movies beyond this game-changer got made despite studio cutbacks, the shuttering of niche labels, the decimation of the indie ranks and the general wailing and flailing of pundits. As for the main impetus behind the Academy's decision to double the field for best picture -- which will widen the appeal of the Oscarcast itself -- the stars are aligned for there to be a noticeable reversal in the ratings trend line. So many people worldwide went to see American movies this past year that interest in this, the final, most prestigious lap of the season, is bound to have been built. Even with 10 slots for best picture, however, there are bound to be raised eyebrows and shrugged shoulders.